Improved data accuracy is the single most common motivation for implementing a bar code system. Often the backbone of operations, data entry enables an organization to produce accurate reports and predictions about future needs and actions. With data entry playing such a critical role in an organization’s operations, it is important to identify the extent to which data entry errors are tolerated. Organizations with integrated bar-coding systems that enable users to scan bar codes rather than manually input data are commonly achieving 99% data accuracy. For organizations in which data errors are a mere nuisance, the difference between 85% and 99% may not seem that important. But for organizations in which data entry errors are catastrophic, such as hospitals and pharmacies, the goal must be 100% accuracy. Bar coding is the best tool that these organizations have to ensure patient safety and thereby greatly reduce the impact of human error. Checking the “Five Rights” – right patient, right medication, right dose, right time, and right method of administration – prevents most medication errors. All too often, the five rights check is flawed because it fails to guarantee the right patient. Bar coding patient information is widely acknowledged as one of the strongest and most cost-effective methods for improving patient safety. Bar coded patient wristbands provide the necessary foundation for preventing errors by ensuring positive patient identification is always available at point of care. Once wristbands are bar coded to provide basic patient identification, numerous other identification, tracking, and data collection applications can be added to take advantage of bar code data entry. A bar code is a graphic representation of data that is machine-readable. 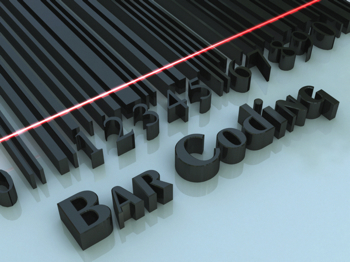 Bar codes are a fast, easy, and accurate way of entering data. Symbology is considered a language in bar code technology. Bar code symbology enables a scanner and a barcode to communicate with each other. When a bar code is scanned, it is the symbology that enables the data to be read correctly. When a bar code is printed, it is the symbology that enables the printer to translate the data that needs to be printed on the label or wristband. Code 128C is a linear bar code that can encode the full 128-character ASCII character set. It is popular for use on wristband bar codes because it is one of the densest linear symbologies, meaning it can encode information in less space than symbologies with lower densities. Code 128 is a variable-length symbology so symbols can be as long as necessary to encode the required data. Code 128 is also the standard for identifying blood products. Code 128 is generally the best all-around choice you can use. Aztec Code was designed for ease of printing and ease of decoding. Aztec Code is a high density 2 dimensional matrix-style bar code symbology that can encode up to 3750 characters from the entire 256 byte ASCII character set. The symbol is built on a square grid with a bulls-eye pattern at its center. Data is encoded in a series of layers that circle around the bulls-eye pattern. Each additional layer completely surrounds the previous layer thus causing the symbol to grow in size as more data is encoded, yet the symbol remains square. Aztec’s primary features include: a wide range of sizes allowing both small and large messages to be encoded, orientation independent scanning, and a user selectable error correction mechanism. A Data Matrix code is a two-dimensional matrix barcode consisting of black and white cells, or modules, arranged in either a square or rectangular pattern. The information to be encoded can be text or raw data. Usual data size is from a few bytes up to 2 kilobytes. The length of the encoded data depends on the symbol dimension used. Error correction codes are added to increase symbol strength; even if they are partially damaged, they can still be read. A Data Matrix symbol can store up to 2,335 alphanumeric characters.